To enhance interoperability among geospatial data from various sources, Open Geospatial Consortium regulates different HTTP interfaces for users to obtain different kinds of geospatial data. For example, the Web Map Service Interface Standard (WMS) supports users to get map images from one or multiple data sources. SuperGIS Server, developed by Supergeo, is a powerful and competitive product that can help users create various web-applications, including Ultra, Flex and Silverlight websites and OWS (OGC Web Service). Complying with the trend of using OGC standards, SuperGIS Server also completely conforms to WMS (Web Map Service), WFS (Web Feature Service), WCS (Web Coverage Service) and WMTS (Web Map Tile Service) standards. This article will introduce how to publish OGC Web Service via SuperGIS Server in the following sections. Before publishing data through SuperGIS Server, you need to prepare your map on SuperGIS Desktop and save it as map project file. To do that, you should firstly open SuperGIS Desktop and add layers you need. Then, design the map with suitable symbology. Once you’ve finished, click Save As to save the map project as SGD format. Users can use SuperGIS Server Manager to publish and manage GIS services with ease. To add a service in SuperGIS Server, first, you need to log in your SuperGIS Server Manager (http://localhost/WebManager/). After that, click “Publish a map service” on SuperGIS Server Manager’s home page. Then select map data from local folder for publishing. Next step, select the service type you want to publish. SuperGIS Server provides users with Map/Cache Service, Feature Service, and Geo-Processing Service. If you’d like to publish WFS, please choose “Feature Service”. To publish WMTS, on the other hand, you should choose “Map/ Cache Service”. After publishing the map, you can go to Application page to create a web application, and select “Add” on the OGC management page to add an OGC application. Now, choose the website you would like to use in “Web Site” field, and enter virtual directory name in “Name” field. Lastly, select usable SuperGIS Server cache service in “Available Map Services” field. After finishing the steps above, choose WMS, WFS, WCS or WMTS in Type on the third page of Web Application and just follow the instruction on the interface. When finish checking the website on the last page of Web Application, click “Done” to finish creating SuperGIS Server OGC service website. OGC web service files are all located in the same directory, and users can only get the service through different URL. Thus, the OGC service is not able to be accessed with web browsers (like IE, Firefox, Chrome), users need to open it with professional front end applications, like SuperGIS Desktop, SuperSurv, SuperPad, etc.. The URL of OGC can be separated into three parts, IP address of the server, Service name, and Service type. Service name refers to the virtual directory you’ve set when creating ultra website through SuperGIS Server Manager. Service type varies with the OGC standard you’ve selected, for example, WMS service takes SimpleWMS.aspx, WFS service takes SimpleWFS.aspx, WCS service takes SimpleWCS.aspx and WMTS service takes SimpleWMTS.aspx. So far, this article has demonstrated how to publish an OGC web service for. Also, users need to get OGC service with different front-end applications or interfaces according to the service structure or protocol. 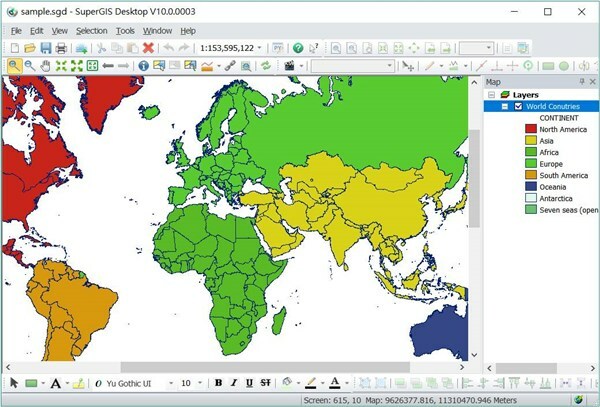 SuperGIS Desktop, the desktop GIS of SuperGIS series, provides OGC add-on for users to add WMS, WFS, WCS, and WMTS data effortlessly. Through the service connection provided by SuperGIS Server or other GIS servers, users are able to add WMS, WFS, WCS, and WMTS layers easily in SuperGIS Desktop. Also, other software that supports OGC standards can utilize the OGC service from SuperGIS Server. Now, try to publish your own OGC service, and spread your data to every corner of the earth in real time!